book Naval-Mail Steamers of the United States by Charles B. Stuart. Type and Characteristics - Screw steamship, built by Boston Navy Yard as steam tug and water tank, launched 26 October 1850, commissioned 6 September 1851, 230 tons, 113ft long x 22ft beam x 10ft 6in draft, 7kts, armed with 1-6pdr, 20 crew. Log Period and Areas of Service - 1853-55, Surveying Expedition to the North Pacific Ocean. 1852-53 - Rebuilt in Boston Navy Yard, received new bow and stern, length increased to 165ft, weight to 382 tons on same beam and draft. 24 February 1853 - Relaunched. 19 March 1853 - Recommissioned, with Lt John Rodgers in command. 3 May 1853 - Departed New York Harbor. 6 May 1853 - Arrived Hampton Roads to join the Surveying Expedition to the North Pacific Ocean, commanded by Cdr Ringgold. 11 June 1853 - Squadron departed for the Pacific, stopping at Funchal in the Madeira's, Port Praya and Simonstown, South Africa. 12 December 1853 - Arrived Batavia, Java. Spent five months surveying Indonesian waters. Early May 1854 - Departed for Hong Kong. 24 May 1854 - Arrived Hong Kong. Summer 1854 - Using Hong Kong as its base, the Squadron surveyed nearby waters and also protected American interests. 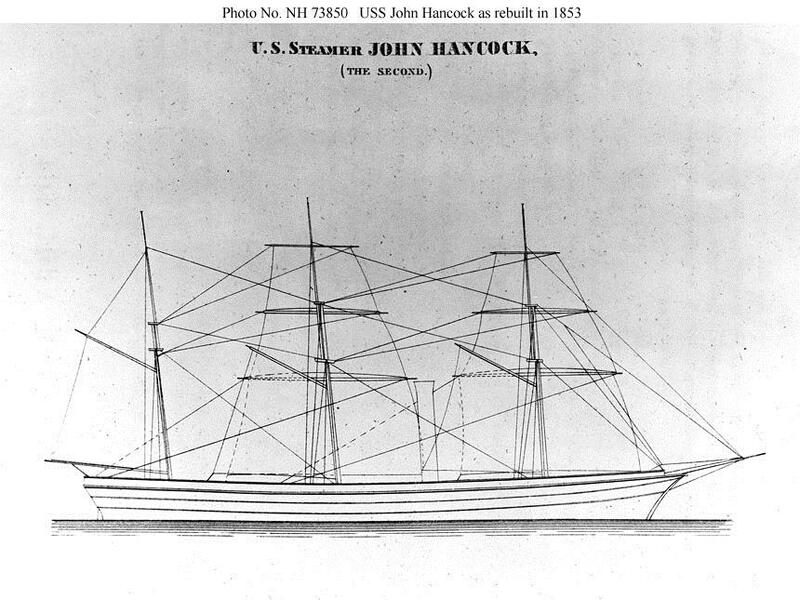 While steaming up the Canton River, two of John Hancock's armed boats were fired on by shore batteries, but silenced. 11 August 1854 - Cdr Ringgold relinquished command of the Squadron and Lt Rodgers took his place. Lt Henry K. Stevens took command of John Hancock. 9 September 1854 - Departed Hong Kong and sailed north, surveying the Chinese coast. 27 November 1854 - Arrived Shanghai and underwent repairs. 28 January 1855 - Continued surveying along the Asian east coast to the Bering Sea, then along the west coast of North America. 19 October 1855 - Arrived San Francisco for repairs at Mare Island Navy Yard. Fate: Decommissioned at Mare Island 23 August 1856, sold in 1865.